Place roasting rack in large roasting pan. Place ham, cut side down, on rack in pan; let stand at room temperature 30 minutes. Meanwhile, preheat oven to 300°F. In small saucepan, heat orange juice, brown sugar, mustard, jalapeño and garlic to boiling over medium-high heat; cook 30 minutes or until glaze is reduced to about 2-1/2 cups, stirring occasionally; remove from heat. Cover ham loosely with aluminum foil. Bake ham 1 hour 30 minutes. 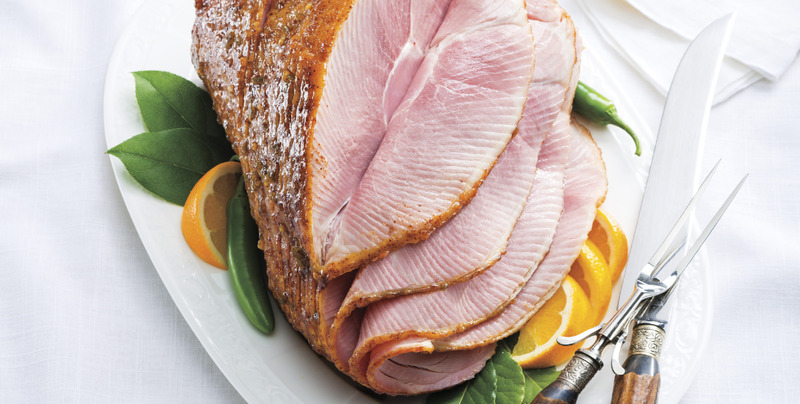 Remove ham from oven; increase oven temperature to 400°F. Reserve 1-1/2 cups glaze. Brush ham with about 1/2 cup remaining glaze; add 1/2 inch of water to bottom of roasting pan. Bake ham, uncovered, 15 minutes longer or until internal temperature reaches 120°F, brushing every 5 minutes with remaining glaze. Transfer ham to serving platter; cover loosely with aluminum foil. Let ham stand 15 minutes before serving. Internal temperature will rise to 140°F upon standing. Garnish ham with orange wedges, bay leaves and jalapeños, if desired, along with reserved glaze.